Our hygienist Melinda considers her job a mission to give her patients the information they need for practicing good dental hygiene and let them know why it is so important. Melinda is Crown Dental’s experienced and friendly dental hygienist. Melinda and Erika have been working together for nearly 10 years now and form a strong team. She is very enthusiastic about her role in the care of our patients, drawing great satisfaction from tailoring oral health programmes to suit each individual’s particular needs. 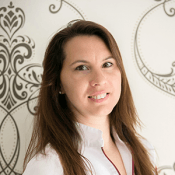 With her several years experience and extensive background in dental technology, Melinda plays a vital role in the dental health and maintenance of all our patients. Since graduating Melinda continues to extend her knowledge and skills with post education courses and training. She is a registered member of the Irish Dental Council as a dental hygienist. Melinda is a proud mother of an adorable little boy and she likes to go hiking in her free time.